In the early 1950′s the urgent need for a center of aeronautical research in Israel became apparent, primarily for defense needs, and therefore the establishment of an aeronautical engineering department at the Technion became one of the top priorities in its development plans. Already in the mid 1940′s, American aeronautical scientists supporting the Technion, proposed the establishment of a chair in aeronautics, with subsonic and supersonic wind tunnels, a proposal that was reinforced by consultation with the then top aerospace scientist, Theodore von Karman. 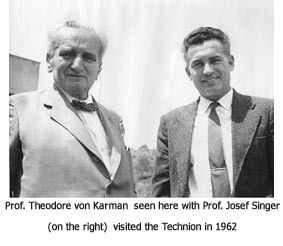 Von Karman advised the Technion in the forties and fifties and was associated with the initial steps leading to the establishment of the Department of Aeronautical Engineering. 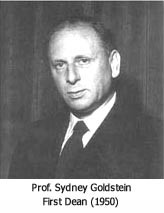 After meeting in 1946 and 1947 with Kaplansky, the then Director of the Technion, and some senior professors, von Karman brought about the appointment of Sydney Goldstein, the eminent Professor of Applied Mathematics at Manchester University and Chairman of the important British Aeronautical Research Council, as Professor of Applied Mathematics at the Technion and Dean of the newly set up Department of Aeronautical Engineering. In November 1950 Goldstein arrived in Haifa and commenced his broad activities. In addition to setting up Aeronautical Engineering, Sydney Goldstein was appointed as Vice President for Academic Affairs and entrusted by General Dori with the task of modernizing the Technion’s curriculum, by strengthening its scientific foundations. The new Department of Aeronautical Engineering and its potential in providing a scientific base for defense developments as well as Goldstein’s appointment were lauded at the time by Prime Minister Ben-Gurion and supported by the Ministry of Defense. Hence the Department was started with emphasis on research before teaching. A system of supersonic wind tunnels was built in the mid fifties, guided by advice from leading experts at Princeton University and a structures laboratory was initiated. The emphasis was on these activities, whereas the first class of aeronautical engineers graduated only in 1958. Furthermore, the concept of a department closely interacting with the starting-up industry was adapted as a guideline to the research activities of the Department that was often considered to be a small NASA. However, it was primarily the excellent students that built the new aeronautical industries and simultaneously the rapidly growing department of Aerospace Engineering. The close relations between the Technion’s department of Aerospace Engineering and the Israeli aerospace industry is also formalized in a bi-annual joint meeting between leaders of industry and the Technion professors, the Advisory Board, which provides some guidance to the development of the Department. The research activities extend also beyond local interests into a great deal of international cooperation. Hence the Department is one of the strongest on campus in terms of funded research. The Technion's is the only department of aerospace engineering in Israel and supplies nearly all the qualified aerospace engineers. Teaching and research therefore cover most of the disciplines of aerospace and system engineering. More than 2500 graduates have been educated in the department and many of them have also actively participated in inter-departmental programs. The curriculum of the Department has been developed along the lines of those of top U.S. and European Universities and is continuously updated and adapted to industry and research needs. Early specialization discouraged, as the aim of the undergraduate studies is to educate a “balanced engineer”, who will specialize later on the job or in their postgraduate studies. The contributions of the Aerospace department are acknowledged both in Israel and abroad and their impact is reflected by their election to Israeli, USA, French, British and international academies and scientific societies. Three faculty members have received the prestigious Israel Prize. The Technion professors of aerospace engineering are actively engaged as consultants and have served in senior Technion and public positions: one as President of the Technion and one as President of the Open University; three as Technion Vice Presidents and many others have played different active roles in the academic administration of the Technion; among the many public duties, two served as Senior Vice Presidents of Engineering of Israel Aircraft Industries, one as Minister of Defense, one as Israel Ambassador to the USA and one as Member of the Israel Parliament. Former students have also distinguished themselves as leaders of industry as well as Commanders of the Israel Air Force.